Review: "Anastassakis, Ioannis: Orbital Attempt" - Sea of Tranquility - The Web Destination for Progressive Music! The first word that came to mind after I had listened to this CD of the Greek Guitar wonder Ioannis Anastassakis for the first time was WOW! Greek guitar virtuoso master of the guitar Ioannis Anastssakis has definitely made work out of the release now in front of me, although I must say a review for this album dating from 2009 is way overdue it still is not unnecessary. Ioannis takes the happy listener on a tour of the guitarvaganza extraordinaire. It is absolutely amazing. The guitar playing on display here is of the highest level and beyond. The title of the album giving away what Ioannis is trying to achieve here with his fabulous playing. Right from the first track of the album until the last note played there is no doubt this here is technically one of the best guitar players in the world today. Technicality alone does not make an album of high standards I hear you all say. Correct-o-mundo, you need emotion, great compositions and atmosphere in the songs. Seldom have I seen, or better yet, heard a guitar based album that was so varied as Orbital Atempt. We get to listen to flamenco, country, progressive rock, great rifffing, fantastic soloing, jazzy guitar, and blues. You just name a style and it is visited on this CD. Surely Ioannis is not capable of doing everything himself, he might be though, but he has not done everything alone as he has had a lot of help on this album. "In the Promised land" Ioannis gives us his way of how a Hard Rock Heavy Metal song should be played, followed directly by his approach on heavy progressive shredding in "Astrochicken's Vittorious Attack". How to excel at speed and soloing is demonstrated in song number three "Weird Thing", a Steve Vai or Joe Satriani influenced song. Walking back into Spain playing a little Paco di Lucia flamenco tune in "A Mi Madre(Soleares)", simply amazing from the fast electric to the fast acoustic guitar. At this point I was completely numb, yet so much more to come. 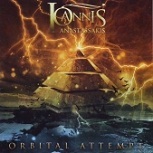 "Orbital Attempt" the title track, is up next, reaching higher guitarkingdom, with the amazing solos and melodic playing, it is almost as if the guitar is singing, some spacy attacks on the strings in Malmsteen or Uli Jon Roth vein. The longest track on the album is called "Progressive Minds" and boy you can say that again, not one word too many here. This is a tune full of changes, intervals and what else. John Petrucci et al eat your heart out. In "Veridiana" we visit Ioannis' home country in a song reminding of southern european sirtaki or bouzouki play, complete with the stamping and clapping. Although the name would suggest it is flamenco? The next pieces on the album all more or less belong in the same area of guitar playing. Heavy riffs, soloing, shredding... simply awesome. How on earth could I have missed this album back in 2009? In the notes with the album is a long list of guitar players Ioannis has collaborated with, among the names already mentioned I would also like to add Frank Gambale, Brett Garsed, Marty Friedman and Paul Gilbert. It seems Ioannis is no stranger among the guitar gods of this day.